Ahh, the collar. It is reported that the collar owes its existence to the ruffles that formed in a shirt around a man's throat in medieval drawstring shirts. It has since come to symbolize wealth, style, and, of course, men's eternal role as human cattle for women everywhere. The gentry shirt is a stylish, understated renaissance shirt with puffed sleeves, a stylish collar and a placket-style button front. It's primarily a Scottish style, worn alone or underneath a doublet or vest. The shirt is made from relaxed cotton and hangs loosely for a casual appearance. Although it's primarily meant for males, it can be worn by women as well. 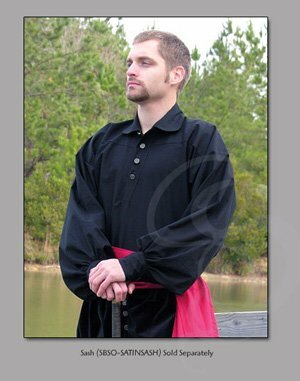 It's available in white or black and is ideal for any renaissance outfit. Material: Soft Cotton. Available in Black or White.